In 15 days the UK will take to the polls and vote to remain in or leave the European Union. I for one will be voting to remain in. I will do so on the one hand because of a deep personal belief in the EU, on the rights it offers, the liberties it upholds and because I want to play no part in any attempt to dissolve the largest peace project in history. But importantly I will also be voting to remain in from a professional perspective. To me, remaining in the EU is vital for the UK’s creative industries. The EU’s Creative Europe funding programme alone has made €1.46 billion available to support EU projects during the period 2014-2020. The UK has one of the strongest track records and highest success rates of any European country in securing Creative Europe funding. European Investment and vitally EU Structural Funds have also benefited UK cultural and heritage activities enormously; supporting the development of community spaces where art is created and presented across every region of the UK; and enabling European wide cultural learning, exchange and professional development programmes that have significantly benefited the UK. But for UK Arts, the benefits of being part of the EU run far wider and far deeper than just funding opportunities. As a Producer I wanted to explore this, and share some thoughts and reflections on why I believe remaining ‘IN’ the EU to be vital for the independent theatre sector. • Our production of The Magic Flute played in repertoire at originating commissioning venue the Komische Opera Berlin (Germany) alongside 3 licensed productions running at Deutsch Opera am Rhein, Finnish National Opera (Finland) and Teatro Real Madrid (Spain). • 1927’s Composer and I travelled to Operdagen Rotterdam, a festival in The Netherlands, where as part of New Music Theatre Now meeting we were invited alongside 10 British Peer Artists and Companies, to present our work to international peers and delegates. • Our creative team has been buried in our London studio creating our next work – an opera, circus and orchestral production commissioned by the Komische Opera Berlin for premiere in 2017. The work will have taken 2 years to create and will have been financed entirely from Germany. As UK citizens and Artists, we are able to travel freely across the EU. We can create, tour and present shows; be commissioned and collaborate to create new works for EU partners; and we can undertake R&D, residencies, exchange and networking activities. This is done with complete ease as we freely move and work across EU borders. There is a very real possibility that if we leave the EU visas, permits and licenses to continue such work might be introduced. Whilst the possible introduction of visas and permits might not prevent work from continuing, it WILL impact mobility. The potential introduction of visas, permits and licenses to create, tour, and temporary work in the EU will come with increased costs and administrative burden. This will discourage some collaborations and partnerships between UK and EU artists and arts organisations as the increased costs and administrative burden will make collaboration less desirable and simply impossible for some. For those of us that tour shows internationally we have to deal with exports and imports on a daily basis. It is a costly and time-consuming process. However when we tour across the EU, not only do we as EU citizens travel freely, but so do our goods. We can move productions, sets, props, costumes, technical equipment across EU borders at no cost other than transport and labour. There are no carnets or permits, no import or export duties, no permissions necessary - there is no administration or red tape to deal with. If the UK leaves the EU - the worlds biggest single market - this freedom of trade and movement will be significantly threatened. Carnets or equivalents, export and import duties will undoubtedly be introduced. Like permits and visas this will increase costs and administration and impact affordability of UK work for EU partners. For many independent artists and companies, working with EU partners has been key to the sustainability of livelihoods and the ability to live and make work in the UK. The level of funds generally provided by EU partners for touring, commission and co-productions are significantly greater than those offered by UK venue and festival counterparts. I am deeply concerned about what the impact the UK leaving the EU might be and the threat it poses to the stability of the UKs dual taxation agreements with EU countries. Although an administrative burden, dual taxation agreements with EU countries protects UK Artists and Companies working within the EU completely from double taxation. Comparably, when we work with non-EU partners it is rare to achieve a 100% waiver of withholding tax and other deductions and levies tend also to be applied to fees. Increased double taxation, additional levies and a potential decrease in value of sterling against the euro, will significantly threaten the possibility of many projects reaching fruition in an already stretched funding climate. This will have a significant impact on the financial position of fragile independent artists, companies and ensembles for whom international partnership and working is a key to business models and thus sustainability. EU platforms, networks, training and residency opportunities offer important routes for supporting the creative and professional development of independent UK artists and arts professionals. Calls for participation are generally open to all - regardless of size, infrastructure and turnover – and financial support for participation is offered through EU partners and resource. These are vital opportunities for those in the independent sector, largely operating without core support, and who are prevented through limited resource from participating in similar opportunities in the UK. Having personally benefited from participation in EU funded European mobility programmes and residencies I know how pivotal and influential these opportunities are to professional development, building international knowledge, networks and contacts and influences the quality of work that goes onto be created for audiences in the UK. I am deeply concerned that if we step away from the EU access to international professional development, cultural exchange and transnational learning that is so vital for a thriving independent arts scene will be negatively impacted. Intercultural, cross border artistic collaborations with our EU neighbours and peers is vital for creative cohesion, and the understanding of our communities, identity and solidarity. In a rapidly changing and increasingly challenging European landscape the ability to collaborate, exchange and work with our EU peers has never been more important, more vital. Collaboration, partnership and working together is key. 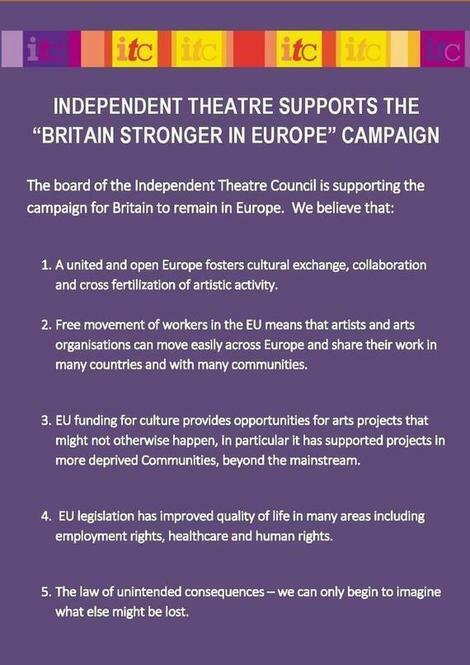 For me the case is clear - our ability to nurture the talent and development of visionary UK artists; to be best placed to make high quality and ambitious work that will reach and resonate with audiences in the UK and further afield and to support the fragile livelihoods of those working in the Arts, voting to remain ‘in’ the EU is vital for the independent theatre sector. Thank you Jo. These are some really practical, on-the-ground concerns that you raise. So much that is working quite well could be lost and so many complications introduced in a 'Brexit' scenario. Impossible for any one to know for sure what will actually happen. Thank you for this very practical insight. Writing from Brussels we hope collaboration and co-productions continue as described after today's EU referendum! If you are planning of your further connectivity relate to the remote working then for it you remote desktop windows 10 pc should know this is mainly made for how you can make your working speed very fast and without any type of the complexity. I'm in quite hurry to change my garden and for that I need Emergency tree removal. I think that you guys know about it and you can help me on it too. I got told my grandad who is from Idaho had six months to live and I was crying my eyes out, so he gave me a hug that felt as if he was forcing it and then told me to cook dinner to take my mind off it while he watch tv.